DETROIT, Oct. 9, 2017 /PRNewswire/ -- DTE Energy today announced its Lapeer solar park, located in Lapeer, Mich., is now operational and producing enough clean energy to power 11,000 homes. The 200,000-panel array sits on more than 250 acres and is one of the largest utility-owned solar parks east of the Mississippi River. DTE broke ground on the project in the spring of 2016. "DTE is committed to providing our 2.2 million customers with energy that is reliable, affordable and cleaner," said Irene Dimitry, vice president of business planning and development for DTE Energy. "DTE plans to reduce carbon emissions by more than 80 percent by 2050 in a way that works for Michigan's economy, homeowners and businesses. We will achieve these reductions by incorporating substantially more renewable energy into our diverse energy mix while also transitioning our 24/7 power sources from coal to natural gas, continuing to operate our zero-emission Fermi 2 nuclear power plant, and improving options for customers to save energy and reduce bills." 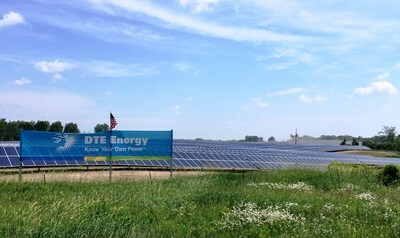 Solar energy now makes up 7 percent of DTE's renewable energy portfolio and brings the company's investment in solar energy to $170 million since 2008 – the most of any company in Michigan. DTE currently powers 450,000 homes from 1,000 megawatts of renewable energy. "The Lapeer project has been extremely positive for our residents," said Lapeer Mayor William Sprague. "It has called attention to Lapeer not only throughout the state but nationwide. I have received many calls from others in government regarding the project's benefits and what they can do to attract solar projects to their communities." DTE's renewable energy portfolio also includes one of the largest urban solar arrays in the Midwest – its O'Shea solar park in Detroit. The O'Shea project is the result of a unique public-private partnership between DTE and the City of Detroit in which DTE redeveloped nearly 10 acres of previously vacant land, helping to revitalize the surrounding neighborhood. Since 2008, DTE has spearheaded more than $2 billion of investment in wind and solar resources. As Michigan's largest producer of renewable energy, DTE has 13 wind parks and 31 solar arrays in its renewable energy portfolio. More than 10 percent of the energy DTE uses to supply electricity to customers comes from these renewable energy resources. An aerial view of the Demille Road portion of the Lapeer Solar Park.